As a gamer, I am constantly looking for video games that will resonate deeply with me and completely engulf me. Uncharted was that series for me. This year, Uncharted 4 finally put an end to the story of Nathan Drake and it was everything I had hoped for. Having Uncharted 4 as my top game of the year is sort of cheating in a way, since I see Uncharted 4 as the end of one of the most enveloping story’s gaming has ever seen. It’s as if the first Uncharted began as a snowball of feelings inside me and Uncharted 4 is a full-fledged avalanche knocking me out of the park. It was beautiful and a fitting end to our hero, Nathan Drake. Uncharted has always been known for its gameplay and this iteration in the series is no different. The inclusion of the new grappling hook adds a whole new dimension of play style. Uncharted has always given you the option to go out guns blazing or stealthily choke your enemies one by one. This time I felt like the areas were a lot larger and you had a lot more options in terms of which way you would approach. Some levels you would be able to swing your away above an unsuspecting foe and take him down, or make your way below him while climbing at the edge of a ledge and pull him down under. If you chose to go guns blazing there was plenty of cover, and incendiary barrels to aid you. The game let you choose what kind of treasure hunter you wanted to be, and I think that’s something really special. It also gives you another incentive to replay the game. If you were a gun wielding vine swinging maniac one play through, your next play through you can be a merciful, neck cracking ninja. If you’ve played any of the Uncharted games, then you know what to expect. Fluid combat, and adrenaline infusing chase scenes. It has it all, and it does it amazingly well. It’s just simple fun. The settings are gorgeous. From Italy to Scotland, Panama to Madagascar. The way you bump into people while scurrying the market’s in Panama, or the way your jeep slides through the mud in Madagascar, everything about the landscapes is absolutely beautiful. You can tell a lot of passion and heart went into creating these levels so that not only would you be seeing Nathan Drake’s story unfold, you would feel it too. It’s a sight you truly have to see for yourself to fully understand. THE STORY. Well the story was to say the least, beautiful. It was beautiful because it was a grand way to send out a hero that resonated deeply through the minds of any avid PlayStation fan these past few years. This time around the story around gave us a lot of insight on Nathan Drake’s personal life, and introduced a completely new character that would take our world by storm, Sam. Nathan Drake’s long lost brother, originally thought to have been dead. Watching how Nathan Drake interacted with Elena, Sam, and even how he dealt with his own feelings really made you feel like this was sort of tying up the knots. It gave us growth in our beloved protagonist, and when the ending came I kind of felt like a proud father. I watched these characters grow these past few years with every iteration in the series, and there I was staring at the end from a beach house. It was beautiful. The story wasn’t just about Nathan Drake. It also boasted an awesome cast with lovable characters. Sam Morgan, Sully, Elena Drake. One of the great things about Uncharted is making every character stand out. None of these characters feel like baggage or clutter. These characters are just as important as the protagonist and the story wouldn’t be the same without them. I mean even Sully and Sam get in the spotlight at the end, one can only wonder what kind of mischief those two are up to. 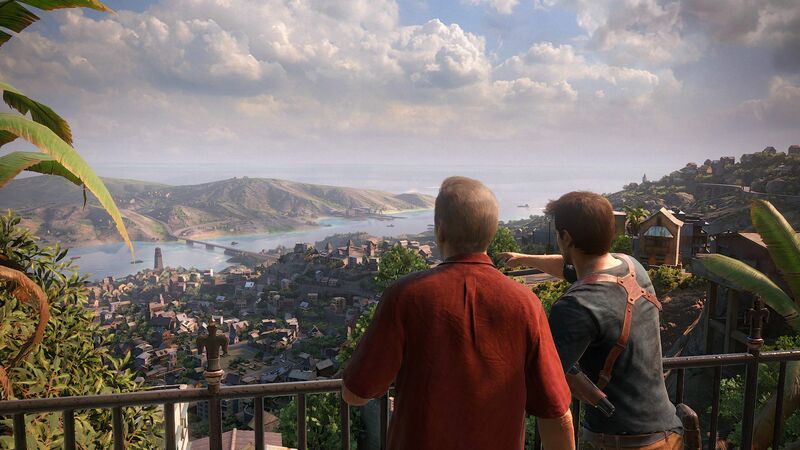 Uncharted doesn’t really feel like just a game, it’s almost like an experience. You grow with these characters, you relate to them, and you feel with them. You feel like you’re apart of the game, like you’re a part of the adventures. I think that’s what truly makes Uncharted special, and why Uncharted 4 was ultimately my favorite game this year. So farewell Nathan Drake, thank you for the beautiful memories you bestowed upon my gaming self. Thank you Naughty Dog for giving me some of the most breath taking scenes and moments in gaming this year. Thank you Uncharted. Daniel was born the same year the Playstation was released. Coincidence? We think not.